Lately I've been very busy as I am going to India for 5 weeks in Jan and so have to finish up a lot of stuff at work. I still try to visit all my favorite blogs and keep myself updated but don't have the time to comment. Will try to be more proactive. I am getting married to the love of my life in Jan, so am very excited about this India trip and that also means there might be a big blogging break. I am trying to write up some additional entries so that I can post those in Jan but don't know if I will have the extra time to do that amidst my crazy shopping and wedding preparation schedule. Christmas is a time when I get the most home sick and miss my family a lot. No matter how much I decorate the house with trees & stars or cook, it is not the same as celebrating it with my family back home. Its my 6th Christmas away from family. I always play some Christmas music in the house in Dec, start baking from the middle of Dec, start wrapping gifts early and invite friends for a Christmas dinner. This helps forget missing family a bit. So this year I started with a Streusel Coffee cake, that I wanted to take to work. Went home early yesterday and it took about 30min preparation time and 35min to bake. I brought it to work today and shared it with my colleagues and everyone seemed to like it. The recipe is from the net with a few changes to suit my taste. Preheat oven to 350 degrees. To make the topping just combine all the topping ingredients together with hand to get the consistency of moist sand. 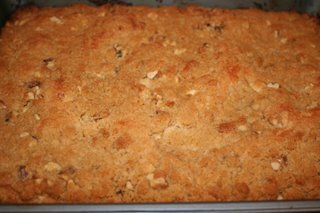 For the cake, in a large missing bowl, cream together butter, brown sugar and granulated sugar with an electric mixer until fluffy. It took me about 15min. Always remember to use room temperature butter for making cakes. Add eggs one at a time and continue beating. Add vanilla essence and mix well. Sieve together flour, baking powder and salt. Add this dry mixture to the moist ingredients a little bit at a time. Add milk as and when necessary and mix well. Pour the batter into a 9 x 13-inch baking pan that has been buttered and dusted with a light coating of flour. Sprinkle the topping over the batter and cover the batter completely. I used maida and light brown sugar for this cake. 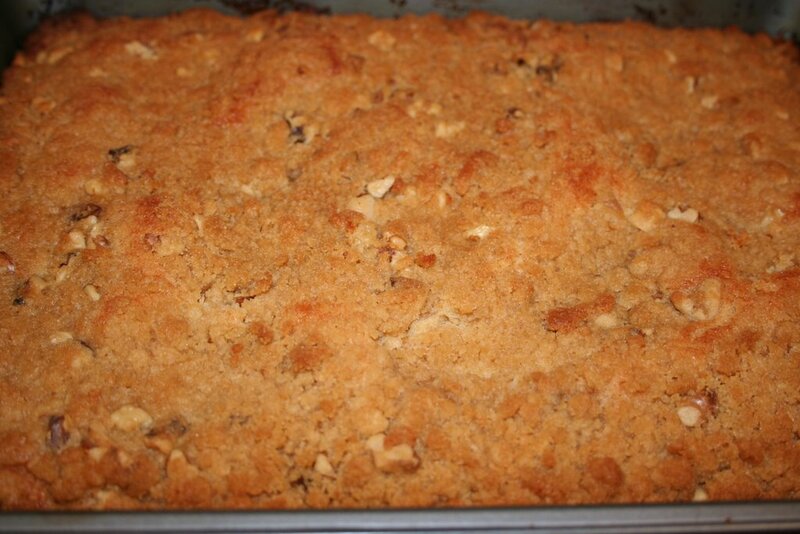 Bake cake for 35 minutes or until the edges just begin to turn light brown. Insert a fork in the middle and pull out to see if the cake is cooked. Cool and slice and serve. 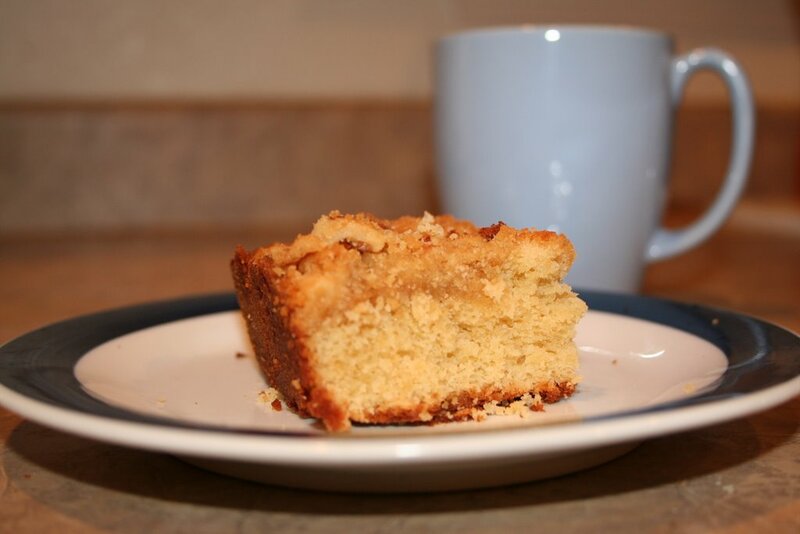 This cake is not too sweet and is a good early morning coffee cake. A tsp of cinnamon can be added to the topping to give it a more festive flavor. 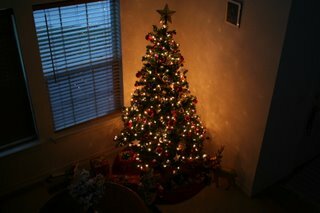 A few pictures of my Christmas tree. 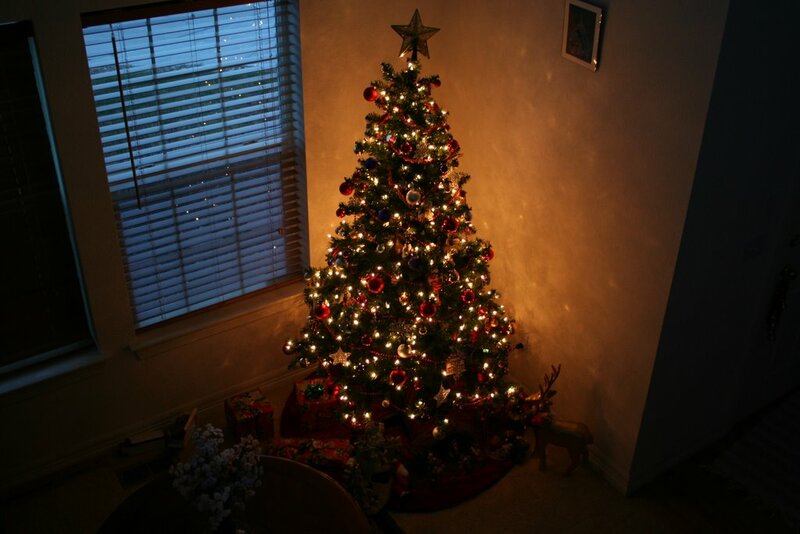 I just love to decorate it as it really brings in the Christmas mood. Coffee cake looks great and I loved the Xmas tree too.Very well decorated! Merry Christmas and Happy New Year:) See you later Deepz. Thanks Asha. Will try to post as often as possible but cant predict how its gonna be in India. I will be definitely visiting your blog though. Deepz, super news! Congrats and best wishes to you for your wedding next month! Don't forget to enjoy yourself through all the frenzied activity! I hope this doesn't mean you will be moving away from Colorado! Is that the sun going down in the last picture? What a lovely picture of your Christmas tree! Once again, best wishes for a wonderful wedding and keep falling in love, with your soon-to-be husband over and over again! Manisha: Thanks a lot. I will definitely be enjoying my stay in India but hope it doesn't overboard with abt 1500 people attending the wedding. Yes that is the Colorado sunset in the background. Also both of us work here in Colorado so Longmont is going to be home for a while. I've known him for about 6yrs now and the falling in love part keeps happening over and over again. Thanks once again for the wishes. Gayathri: Thanks. Merry Christmas and Happy NewYear to u too. Hope next yr u guys r here for Christmas. 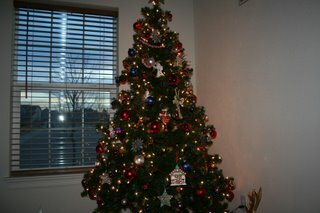 hey deeps.....the tree and cakes look beautiful...as always :)....thats a ton of snow :D. MERRY CHRISTMAS!!! Anonymous: This is a cake that is had along with coffee or tea. Sorry for disappointing you.